I'm pretty sure that most, if not all of you have heard of dry skin brushing before. It's basically a holistic technique where you stroke your body with a huge bristled brush for the purposes of stimulating blood flow while exfoliating the skin. Sounds good right? Loads of women utilize their body brushes before jumping in the shower to loosen dirt and hopefully diminish the appearance of cellulite. Before getting into rebounding, I'd often brush my body to stimulate lymphatic drainage and detoxification. Dry brushing the body is cool and all, but I think I've stumbled onto something even better. My newest obsession is dry face brushing. Actually, I face brushed years ago but completely forgotten about until recently. Now that brushing my face regularly again, I'm kicking myself for having ever stopped. What is face brushing exactly? Basically, it's just like body brushing except you're using a tiny bristled face brush. The same rules apply. You are still trying to stimulate lymphatic drainage while promoting toned, firm skin. Face brushing does a wonderful job of exfoliating and bringing blood flow to the surface of the skin. I started dry brushing again after reintroducing retin-A to my regimen. Retin A always makes my forehead peel. To combat this, I decided to gently remove the flaky skin with the help of a dry face brush. It worked like a charm! Then I remembered how much my skin improved when I dry brushed years ago so I've since kept up the habit. 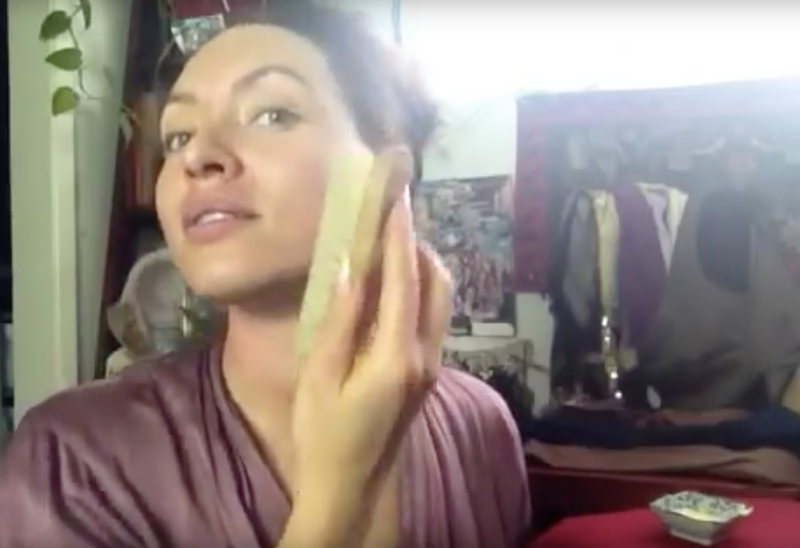 Dry face brushing is probably one of the most potent forms of manual exfoliation. I'm my opinion, it's more powerful than scrubbing with microbeads. If you have dry facial skin, you'll actually see dead cells lift from the surface of your skin. Beyond the surface exfoliation, one of my favorite reasons to dry brush my face is for the anti-aging effects. I use similar lifting motions to when I massage. I believe the skin responds positively to massage and manipulation. Dry face brushing is a bit more abrasive to massaging the face with your hands. So in theory, you might experience more lifting and toning than massaging with your hands alone. It also really helps speed up cell turnover. And, with the top layer of the skin removed, you create the environment for your products to absorb better. I categorize this as a more advanced level skin treatment. Meaning, if you have sensitive skin that's irritated easily (or prone to flare up), you may want to sit this one out. Or, at the very least, approach with caution and dip your toes in by grabbing a more gentle brush to experiment with. Your skin might eventually build up a tolerance so there's no need to go overboard if you're just starting out. I don't face brush every day because I like to give my skin some time to regenerate in between sessions. Body brushing, on the other hand, you can do on a daily basis. I love dry brushing!! It is so soothing and refreshing. I did notice a big difference in my skin after I used it consistently. Thanks to your blog I have been getting double stares from people. I implement almost every thing you say! Girl, your my secret weapon. Well to the men anyway. I tell all my girlfriends about your blog. OMG Sukina, your comment made me so happy! You have no idea how much I appreciate it. This blog is like my passion project. All I want to do is give out advice that positively impacts the lives of others. Oy. I love my salux towels but I really need to get back into dry brushing. So do you suggest doing this in the morning? I use lactic acid at night though. Should I just dry brush the mornings after I don’t use lactic acid? Or do one or the other? I would alternate between the two since both exfoliate the skin. Give your skin a day or two to heal from the lactic acid then dry brush later in the week. Just yesterday I was sitting in the stylist's chair getting a haircut and I was saddened by how slack my skin looked. I was thinking to myself about how to stimulate collagen growth to smooth and firm my skin and I wondered if a person could brush their face, the way people dry brush their body. And today I stumbled upon this blog. How weird is that? It was fate, Susan! Glad you're here.